The release herein presented is the special edition featuring both the visual and audio side of latest PRIMAL FEAR. Both are parts can be purchased in separate but I guess this combo is the best option for the Metal fan. On to the music now. 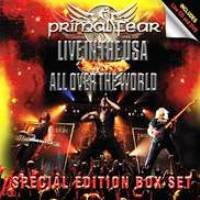 PRIMAL FEAR releases their second DVD entitled “16.6 - All Over The World”, seven years after their first “The History Of Fear” video disc. With eight albums in their career, PRIMAL FEAR should no longer be recognized as a new hopeful band in the classic Metal field, right? Even more, Ralf Scheepers is something more than the perfect voice that JUDAS PRIEST should have in their camp after Rob Halford’s departure in the early 90s. But – for me – the most important think regarding this German act’s portfolio is that they play, sing, act and sound Heavy Metal. No, no power/epic/symphonic/neoclassical/teutonic crosswords here: PRIMAL FEAR plays Heavy Metal and satan (or god, U choose) knows of how much importance for the prosperity and livelihood of all forms of the Metal world sounds like this are. By making their style somehow more pompous after inking deal with the Frontiers label, PRIMAL FEAR was sporadically misjudged as flirting with the ‘symphonic’ genre. Nah, that’s mostly a matter of production and recording layers, I think. The basis of the band was and shall probably always be in-your-face predictable yet passionate European Heavy Metal with lots of JUDAS PRIEST (songwriting patterns) and a couple of HELLOWEEN (speed, refrains) references. Good think as widely seen in this new DVD is that the voice of Ralf Scheepers (GAMMA RAY, TYRAN PACE) and the volume of Mat Sinner (SINNER, GODDESS SHIVA) are alive and kickin’, with the rest of the team willing to show its teeth too (hail to Randy Black’s drum assault). The bonus material of the DVD is teasing: five of the band’s latest promo videos (see tracklist below) and hand-camera footage from the bands worldwide tour are available to the fanbase’s delight, while episodes from the recording sessions for the band’s latest studio CD are present too, including small quotes by the musicians. The only thing that should be mentioned for the “Live In The USA” CD is that – as its title shouts – was recorded in America (Atlanta, New York and Los Angeles) in its entirety. The sound is very good, the band’s mood seems alright and the reaction of the crowd surely is more vivid. I like PRIMAL FEAR’s music since they do not re-invent the wheel but maintain the principals of archetypal Metal; sometimes the simplest of things are the ones merely missing from our daily happiness, and I feel secure bands like this one are still around and loyal. Again said, the “Live In The USA” / “16.6 - All Over The World” special edition is the best solution if you want to spend time with this honest Metal act and get familiar to their latest whereabouts. P.S. : The “Fighting The Darkness” trilogy sees Pamela Moore joining Ralf Scheepers onstage for a sensational duo.